Hallett Movers since 1926 has served the Chicago area with both commercial moves and library moves. In addition, Hallett can warehouse and store data and materials in it's warehouses all around the Chicago area. to handle your unique move then Hallett Movers are here for you! In 1926, Glenn Hallett opened a used furniture store on Chicago’s South Side and bought a Model "A" Ford pick-up truck for deliveries. One day, a customer asked Glenn for his expertise as a mover instead of a furniture salesman—and the Hallett family moving business was born! After applying for and receiving household and office moving authority from the state of Illinois, Glenn closed the used furniture store to concentrate on the moving business full-time. As business picked up (literally), he added storage to Hallett’s services, acquiring a 2,000 square foot warehouse. When Glenn’s sons – Tom, Bill, and Jack – joined the company in the 1950s, he changed the name from Hallett Express to Hallett & Sons Expert Movers, Inc. Since these beginnings, the Hallett team has met the challenges of moving whatever our customers need to have moved. The Hallett team has relocated entire companies, handled priceless, one-of-a-kind museum pieces, and moved millions of books throughout the country. In our Chicago home, we conduct on-going projects with vital local institutions such as the Newberry Library, Northwestern University, and the Franciscan St. James Hospital. We recently relocated 23 families in a transitional housing center plus the staff of New Moms, a non-profit organization addressing homelessness and poverty among young mothers in Chicago, and acquired donated furniture from other clients for their beautiful new facility, saving the program thousands of dollars. We have worked coast to coast from the University of California system to the U.S. Naval War College in Newport, RI. And in the nation’s capital, we have worked with the Smithsonian institutions and universities such as Georgetown University Law Center, which led to moving their extension in Qatar. 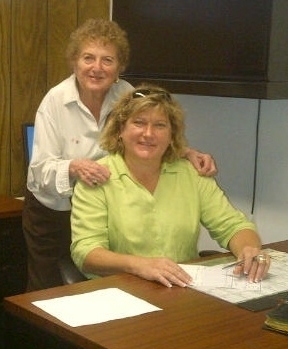 In 2011, Dawn Hallett- Glenn’s granddaughter- stepped up to lead the Hallett team. She carries on the legacy of being a preferred vendor for some of Chicago’s most venerated cultural institutions and of giving back to the communities where we work. In Summit, IL, where we are located, we facilitate the donation of furniture and books to schools, community centers, and shelters. We have also sponsored and participated in charitable events such as the Loyola 5k for Pediatric Care since 2014. Under her direction, the company has also increased move services to medical and laboratory facilities and expanded to manage complex moves for clients overseas. Today, Hallett Movers owns a 100,000 cubic foot warehouse in Summit, Illinois. We operate a fleet of more than 15 fuel-efficient vehicles. We have created methods and technologies - like our range mover - to solve the problems inherent to large scale, multi-part moves. We embrace opportunities to improve and expand our operations, and we can deliver your institution to its new location in the best possible order.